A complete ready-to-use kit features the ATS Tandem Alligator Squeezer, plus a generous 17 piece assortment of dimple dies and squeezer sets (p/n SKT17). The powerful ATS-214A Tandem Alligator Squeezer incorporates two pistons to deliver twice the force of a standard squeezer at the same air pressure. It's lightweight, compact, and efficient design is modeled after the industry standard Chicago Pneumatic 0214-A squeezer, and will work with all yokes and accessories compatible with the 0214-A. 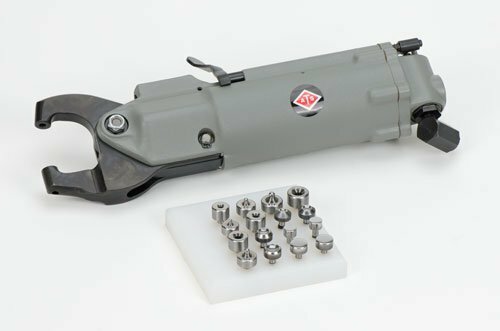 With enough force to squeeze up to 3/16" solid aluminum, or mild steel rivets, this riveter will easily fit most of your riveting needs without breaking your budget. •Delivers 6000 lbs of force at 90PSI. If you have any questions about this product by Aircraft Tool Supply, contact us by completing and submitting the form below. If you are looking for a specif part number, please include it with your message.